At Microsoft’s Build conference this week, Microsoft set up what it calls a “shared immersive experience”: a group of HoloLens users perched high up in a virtual sky, directing another group of mixed-reality users on the “ground” through a short maze. It’s easy to see this as a metaphor to describe the relationship between the two devices. And in some ways, it works. Microsoft’s HoloLens is priced at a lofty $3,000 for commercial partners and developers; mixed-reality devices are literally a tenth of the price, or $300. I’ve tried both. I’m cautiously impressed with the Acer Mixed Reality Developer Edition that will be sold as a consumer device this holiday, but it could still learn a trick or two from the HoloLens. To be clear, we’re talking about two different camps of devices: augmented reality headsets like the HoloLens, which superimposes virtual objects over the real world; and virtual-, or “mixed”-reality devices that occlude your vision. (In theory, mixed-reality’s simulated world incorporates objects from the real world.) Mixed-reality devices are also tethered to a PC by a display cable, while the self-contained HoloLens is totally mobile until it runs out of battery power. But if Microsoft can run the same executable and Windows 10 OS on both, they can’t be that different. Holograms like this one are the entire premise of the HoloLens, while mixed-reality devices are much closer to traditional virtual reality. The slimmed-down design of the HoloLens is still head and shoulders above its much cheaper cousin. Though I would say that both devices probably weigh about the same, the HoloLens more evenly distributes the weight around your head, resting on your ears and nose and even an optional headstrap across the crown of your head. Acer’s device concentrates the weight a bit more in the eyepiece, and its single restraining strap was awkward to buckle. The Acer device flips up, though, like a pair of sunglasses. I vastly prefer how the HoloLens tightens around your head with an adjustable dial. I’ve used the HoloLens for about 40 minutes at a time, and it’s actually pretty comfortable. Acer’s device felt awkwardly balanced, though that could have been due to my inexperience with it. A Microsoft employee demonstrates how the Acer device flips up. Because I own an Xbox, I actually quite like the way in which you control the mixed-reality experience through the Xbox controller. One of the drawbacks of the HoloLens’ limited field of view is that it must literally “see” your gestures with its front-facing cameras. In practice, that means that you’re tempted to always keep your arm up and at the ready, which gets old fast. Mixed reality solves that problem with a button press. On the other hand, Cortana is part and parcel of the HoloLens experience. While you can plug earbuds into the mixed-reality device, there’s no real way to trigger Cortana on a mixed-reality device without a headset. I have a hard time understanding how Microsoft is okay with that. That’s one of the areas in which the HoloLens shines; with so many stable reference points for your eye to light upon, there’s absolutely no nausea. One of the mixed-reality experiences I tried at Build, dubbed “Datascape,” cast you hundreds of feet above a stable, virtual map of the region. Whipping my head about, only induced the faintest hint of vertigo. Keep in mind, though, that the only real motion in the scene was the spinning of windmills, far away. Acer headsets lined up at the Datascape demo station. Acer’s device renders 1440x1440 pixels per eye, enough resolution to render “distant” objects fairly clearly. (Microsoft specs the HoloLens at “2.3 million total light points of holographic resolution,” which doesn’t say much.) The HoloLens can also only superimpose virtual objects across a limited area, which must be scanned with the external camera. Both the HoloLens and the mixed-reality devices utilize gaze tracking, a nice feature that uses your eyes as a cursor. Both also leverage so-called “inside out” tracking. Devices like the HTC Vive rely on external sensors to track you as you move about the room, while both the HoloLens and the mixed-reality devices do not, saving money. In the shared HoloLens-mixed-reality experience, HoloLens users acted as “clouds,” using their gaze as laser pointers to guide the mixed-reality players on the “ground.” (If there was supposed to be shared audio between the two groups of players, it didn’t work.) HoloLens users could wander around a physical table upon which a virtual model of the maze was perched; the mixed-reality players sat in front of PCs, using their gaze to mark a spot to “teleport” to via the Xbox controller. Both methods of interactivity worked well. Though we could have theoretically walked around the Datascape mixed-reality demo room, I was hemmed in by tables, and could only shuffle a step or two in either direction. Also, there was no indication of any “mixed” environment, where those desks were incorporated into the simulated scene. “Mixed” reality was essentially just virtual reality, at least in that demonstration. Does Microsoft have its own mixed-reality plans? I still think that there’s a vast, untapped world of HoloLens gameplay (a 1981 sci-fi novel, Dream Park, anticipated a world where virtual holograms are overlaid on top of real-world actors, creating “zombies” and “monsters”) but the market will obviously favor the cheaper, mass-market device. I’m not entirely sure if the HoloLens will just quietly fade into history, alongside Google Glass, or if there’s still a larger role for it to play. Just like Microsoft fumbled its way through the launch of Windows 10 S and the Surface Laptop, the company has yet to clearly define the role of HoloLens going forward, and its relationship to mixed-reality devices. As for mixed reality, I suspect that most enthusiasts will regard both the Rift and especially the HTC Vive as premium devices. 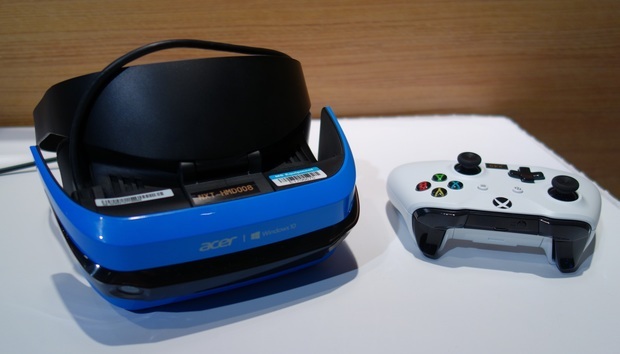 Mixed-reality headsets will be viewed in the same llight as mass-market PCs. Maybe one day we’ll see the Surface brand extended from the Studio to mixed-reality devices. There’s still one other possibility to consider when comparing the HoloLens and mixed-reality devices, and that’s Microsoft taking a more active role in pushing these devices forward. In terms of price, there’s lots of room between a $299 mixed-reality headset and the $799 HTC Vive. We all know that Microsoft has launched two-in-one tablets, all-in-ones, and now laptops under the premium Surface brand. Would Microsoft benefit from a “category-defining” device in mixed reality? After trying out one of these third-party headsets, I say yes. Both the PC and Microsoft’s upcoming Project Scorpio console are optimized to favor virtual reality. Perhaps an announcement is forthcoming at an upcoming hardware launch in China or next month’s E3 show. It’s clear that this new crop of mixed-reality devices could take some pointers from Microsoft’s HoloLens design team. In a few weeks, who knows? Maybe we’ll see Microsoft try to lead the pack yet again.